The Fairmount area contained a few non-residential developments prior to 1890 that helped to shape the neighborhood as it displaced them. The most important of these was the Central Lunatic Asylum, built on property originally part of a military hospital during the Civil War. The southern edge of the grounds was S Street, which later became Fairmount Avenue. “Be it enacted by the General Assembly, that a Lunatic Asylum is herby established, to be located temporarily at Howard’s Grove, near the city of Richmond, which shall be for the reception and treatment of colored persons of unsound mind.” Ã¢â‚¬â€ excerpt from Act Incorporating the Central Lunatic Asylum (as found in 1871/72 issue, p. 2). Published in Richmond, Va. ATLA no. : 2005-S039, 1 reel (1871/72-1877/78). In December 1869, a former Confederate Facility, known as Howard’s Grove Hospital, was designated as a mental health hospital for African-Americans. 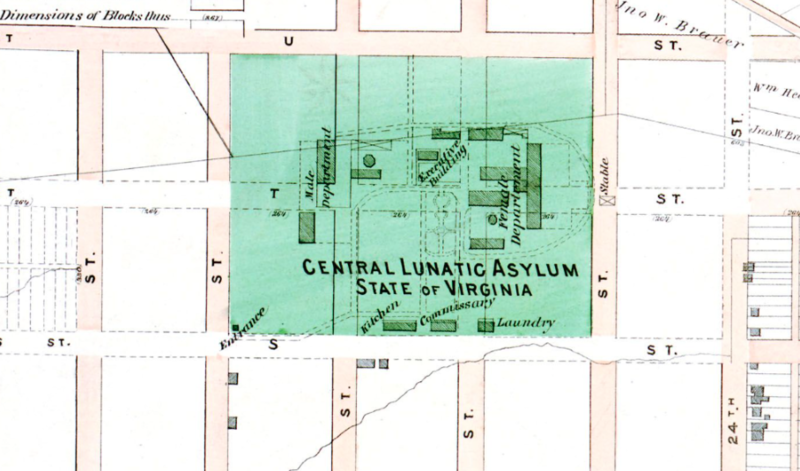 The name was later changed to Central Lunatic Asylum. In June 1870, the General Assembly passed an act incorporating the Central Lunatic Asylum as an organized state institution. When the Commonwealth of Virginia assumed ownership, there were “123 insane persons and 100 paupers, not insane” housed at the asylum. In 1868, the Freedman’s Bureau acquired land known as Howard’s Grove, (or Howard Grove), located one half mile east of the city of Richmond, on the Mechanicsville Turnpike, in Henrico County. Through a lease from Mr. Bacon Tait (or Tate), the Bureau renovated several barrack-type structures that had been used as a Confederate hospital during the Civil War. The new facility became known as Howard’s Grove Freedman’s Hospital. The hospital was turned over to the state by way of General Order number 136 issued by Major General Canby, Military Governor of Virginia in December 1869. Beginning January 1, 1870 all African American patients at Eastern Lunatic Asylum in Williamsburg, (the only state institution at the time to accept black patients), as well as all jailed black lunatics from across Virginia, were to be removed to Howard’s Grove for treatment. The General Assembly passed legislation in June 1870 renaming the facility the Central Lunatic Asylum and designating it the official “reception and treatment facility for colored persons of unsound mind.” This legislation was enacted with the stipulation that the Howard’s Grove location was to be temporary. Many patients arrived at Howard’s Grove by way of civil commitments made by local judges at the request of friends and family. Other patients were removed from local jails and criminally committed. The asylum was overseen by a superintendent who answered to the Court of Directors, and physicians, nurses and matrons were employed to care for patients. The buildings at Howard’s Grove during the period of 1870 to 1885 were described as being of plain, if not crude, wood construction. They were divided into sections according to the patient’s particular ailment or behavior. Residents were fed in their cells as no dining facility existed at that time. There was no sewage system, and light was supplied by kerosene lamps and candles. In order to enlarge the institution and alleviate the poor living conditions, a 300 acre tract of land was purchased in March 1882 by the city of Petersburg and given to the state for the purpose of constructing a permanent mental health facility for African Americans. Construction of the new facility near Petersburg was completed in early spring 1885. An early institutional history notes that treatment at Central Lunatic Asylum during the 1890s was humane, and emphasized the value of work and the benefits of recreation. However, practices at the facility also included seclusion, mechanical restraints and the administering of hypnotics. In 1894, Central Lunatic Asylum was officially renamed Central State Hospital. This piece of legislation also altered the names of the other mental health facilities in Virginia, in order to inspire a more positive image of the institutions, and of mental health treatment in general. The map above is a detail from an 1877 map of Richmond by F.W.Beersmap (specifically Plate B). All of the text is drawn from multiple documents online at the Library of Virginia, with the intro text sourced from the Fairmount National Register of Historic Places registration form (PDF). Thank you so much for this history! I worked for a little while at the 2300 Club and they had a frame version of this map hung in one of the dining rooms. I often wondered about the Lunatic Asylum and even drove around trying to find it. I thought all of Church Hill was a Lunatic Asylum? Bah dump bump! I am here all week! Try the veal! Thanks for that little bit of history… Bacon Tait (Tate) was everywhere… he also had some dealings in Woodville’s history. And in my map of the East End, Howards Grove overlaps Fairmount. Hasn’t this facility been relocated to 900 E. Broad? @ Cadeho: I’ve never been able to get much of an idea as to what encompassed Howards Grove. What do you know? BEAUTIFUL MAP!!! THAT HELPS ME GREATLY!!! Basically it’s between Redd St and Little Page, Coalter and Mechanicsville and the block bounded by 19th, T, Fairmount and Mechanicsville. Some of those properties in that block have Howard’s Grove as their legal descriptions which I believe would be on their deeds. I’m not sure but possibly the Bryan and Spotsylvania streets that were south of Little Page were also Howard’s Grove. Again… thanks for the map… I wonder if I can buy it? Now I see exactly what was Rutherford’s and Capt Halleck’s. I can’t wait to take closer looks at the rest of the city. The next time I’m in Richmond, I’ll walk – not drive – to find the Asylum, which I know doesn’t exist. Who is the custodian of all records. I am doing research along with me wife. We received information that a relative died at this hospital. We are condcuting an ancertry check and want to locate relatives. Any information is helpful, Thanks. I might be able to help. Send me some contact information and your relative’s name, date of birth, and when he died. Researching families history, I stumbled upon this site while on another site, trying to make sense of ancestors I’m looking for. This is an interesting site and never would have known that this information would be available. Looking for McDonald’s, Ferrell’s and Berry’s. My mother and I are looking for a family member that was a patient at this hospital about 1942-1950. How do I get in contact with someone about this matter. Thank you for help. I’m searching for some images of the actual asylum. All I can find at this point is a painting of Howards Grove Hospital which pre-dated the asylum. Any ideas about where to search for images? Hello my Great-Aunt Georgia Berry was at this institution.